When it comes to selecting headphones you have a lot of options. Regardless of your budget, the headphone market is massive and extremely saturated. There are dozens of manufacturers out there, all competing for your business by offering a wide variety of products to fit every need and price point. To help you sift your way through the modern headphone market we have, in consultation with a team of avid audiophiles, created a list of our top five over-ear headphones under $50. We spent hours working with our team to research and identify the features that define a good pair of over-ear headphones. 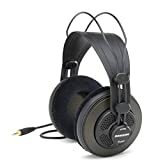 Once we had established our list of criteria we then searched all over the Internet in pursuit of the five best pairs of headphones that best fits the bill, for under $50. After reviewing each pair in our top five list in detail we then finally selected our favorite pair from the bunch: the Audio-technica ATH-M20x. A simple yet precisely executed design, the ATH-M20x provided the versatility and portability we needed while delivering an excellent audio experience in an extremely comfortable fit. While they may not be the flashiest pair on the market you would be hard pressed to find a better made pair of headphones for under $100. To construct our list of criteria we consulted with a wide range of audiophiles. From on-the-go socialites to long time desk-jockeys, we picked a diverse team that we thought reflected the massive size and variety of the consumer headphone market. We then took this list and hunted down the top five over-ear headphones under $50 that fit the bill. 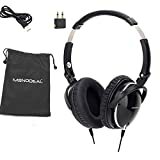 When you go to the store to buy a pair of over-ear headphones it is easy to immediately be overwhelmed by the variety of options and technologies available to you. At the end of the day though, the primary reason for buying a pair of headphones is to improve your listening experiences. For this reason alone our experts unanimously concluded that the most important quality in any pair of headphones is the sound quality. No matter if you are using them to listen to music, Skype call your boss, drown out the sound of noisy room-mates, or to play video games without disturbing your family. The main goal of headphones is to hear with great quality and isolation. Several factors can contribute to the quality of your sound. The first is the speaker’s audio driver, both its diameter and materials. Larger sized speaker drivers typically produce a clearer and louder sound, especially in the lower segment of the range. Another key factor to consider when it comes to sound quality is the range of frequencies that the speaker can produce. The standard range for human hearing is 20Hz to 20kHz so it is important that your headphones range covers this at the very least. Many high end models with have ranges larger than this. To really enjoy your new headphones it is important that it fits comfortably on your head. While this may seem obvious, periods of extended usage may accentuate slight discomforts into more substantial pain and fatigue over the long term. Comfort comes second to sound quality in our list of criteria by only the slightest margin. When picking over-ear headphones it is important that you select a pair that has comfortable, well fitting ear-cups and adjusters that will ensure a good fit. When the headset is worn, ear cartilage should not be twisted or deformed in any way; an insufficiently padded or too tight headband can also cause a great deal of discomfort. Additionally, when testing a pair of over-ear headphones it is important they do not pinch too tightly around your ears. Even a slightly too tight fit can cause a significant amount of pain our your temples and may cause headaches after many hours of use. The last factor to consider when it comes to comfort is the overall weight of the headphones. The weight of your headphones is extremely important as a heavier pair of headphones will accentuate any discomfort or pain. Therefore it is best to pick as light a pair as possible, especially if you are struggling to fit a perfect fit. The world can be a very noisy place and many of the environments where you want to enjoy your music in peace can be irritatingly loud. Examples include long bus rides filled with crying children or flights where you have been seated just behind the engine. To enjoy your music or audio, without needing to resort to near deafening levels of volume, headphone manufacturers have developed noise cancelling technologies to block out environment noises. These technologies come in one or both of two types: passive or active. Passive noise cancelling technology attempts to isolate the listeners ears via sound dampening materials. In over-ear headphones this is typically done by constructing ear-cups from noise dense foam. Active noise cancelling is slightly more involved. This type of noise cancelling uses tiny microphones to listen to ambient noise that is directed towards the user. These audio waves are then identified and neutralized by counteractive sound waves emitted by the headphones. While typically more effective, active noise cancelling comes at a price, the batteries required to power this technology increases headphone size and weight. The most effective noise cancelling schemes are created by pairing both passive and active noise cancelling attributes. This combination has been very successful at creating isolated audio experiences. Over-ear headphones can often be large and bulky, especially in the midrange market. This can pose a portability problem as, unless you are looking for high fidelity studio sound, you probably want to take your headphones with you on the go. Headphones size and weight can make a big difference when you are carrying them around in your bag all day. Larger and heavier headphones are also more likely to get in the way and get damaged or broken. To combat this, it is important that your headphones meet your portability needs. If you plan to keep your headphones by your desk all the time then by all means, feel free to ignore portability. However, if you are always on-the-go and need your music and audio to travel with you then consider getting headphones that are designed to be portable. Features that increase portability include hinged head pieces, speaker size, removable cables, overall size, and the inclusion of compact and protective carrying cases. These days it is common for manufacturers to include tons of extra features into each pair of headphones they make. However, the usefulness of these additions can vary greatly from user to user. It is important to first consider your headphone requirements before selecting a pair of headphones based purely upon a particular feature. For example, some headphones in this range will include wireless Bluetooth connectivity. If you like to move around or exercise with headphones on then this could be an important feature for you. Another feature that is common to see headphones, though of arguable usefulness, is in-line volume adjusters. While some users find this feature to be extremely important, others may not find it useful at all. Other extra features often included in headphones are replaceable audio cables and built-in microphones. Not all manufacturers include the same features in headphones so be sure to select a pair that match your needs. For our favorite headphones under $50 we decided to abandon some of the more feature rich options and instead go with the simple yet impressively well made Audio-technica ATH-M20x. While these headphones don’t boast the options and features of some of the other headphones we reviewed, their superb audio quality and excellent engineering made these our clear winner. In the ATH-M20x, Audio-technica seemed to embrace the mantra of “do a few things well”. You won’t find massive speaker drivers, active noise cancelling, wireless Bluetooth connectivity, or volume controls on these headphones. What you will find is superb audio quality, lasting comfort, and a simple single cable design. Passively isolated by comfortable ear-cups, these headphones provided an immersive and authentic audio experience without any distortions. Small and sturdy enough to pack in your bag, yet comfortable enough to use for hours, the Audio-technica ATH-M20x headphones take the first spot in the ranking of the best over-ear headphones under $50. The Samson SR850 headphones stand out in our line-up as the pair of headphones that are most dedicated to your audio quality and experience. The SR850 headphones make a bold statement with rich and powerful 50mm audio drivers that are fitted into an open-back housing. This design sacrifices audio privacy for an extremely immersive and isolated audio experience. By pairing the powerful speakers with an open-back design, these Samson headphones easily delivered the best sound quality of all the headphones we tried out during this test. However, be careful not to turn the volume up too high in the library or the open-back design will be blasting the whole floor with your music. In addition to having excellent audio quality these headphones are also extremely comfortable, boasting large and soft ear-cups and self-adjusting headband that will keep you comfortable for long hours of listening. Staying true to their audio-focused design, the Samson headphones don’t offer any extra features, nor are they particularly portable. These audio-focused stay-at-home headphones weigh in at a hefty 500 grams. Nearly twice the weight of some of the other competitors. The Ausdom M06 headphones stand in a stark contrast with the two other pairs of headphones we have already reviewed. 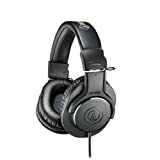 Where the Samson SR850s are a simple and focused pair of headphones the M06s are the exact opposite. They have a bit of everything. The M06s, while providing a good level of quality audio and passable passive noise cancelling, manage to stand out by their inclusion of wireless Bluetooth technology. With up to 20 hours of battery life these headphones are a great option for highly mobile users. In addition, the Ausdom’s smaller size, built-in microphone and on-ear audio controls to give you completely portable package that weighs in at a mere 220 grams. While these headphones may not provide the best comfort or audio they are extremely versatile for on-the-go users. When it comes to portability and ease of use on-the-go, the Mododeal MD-030 headphones are a great option. With this offering Monodeal has managed to pack 40mm drivers as well as active noise cancelling technology into feather-light headphones that weight an impressive 150 grams. While the active noise cancelling will not impress any audiophiles it is a great addition for headphones in this price range. In the MD-030s, Monodeal has stripped back some of the padding to cut weight. The result is a headset that is comfortable in the short term but may leave users with discomfort after a few hours. This discomfort was most notable underneath the headband during our tests. To increase portability the headphones were designed with foldable hinges, allowing them to be efficiently stored when not in use. An excellent engineering feature. Overall, the MD-030s provide adequate sound offset by a great price and excellent features and portability. A relatively new brand, Edifier has delivered an solid product in the P841s. Powered by 40mm audio drivers, these speakers produce excellent audio quality, particularly in the low end. Supported by passive noise cancelling ear-cups the P841s provide for a great listening experience. While these headphones have a padded and fully adjustable headband, we found them to be slightly uncomfortable after many hours of use. Users with a narrower head many not suffer from this a problem. A big advantage of the Edifiers is their sturdy construction and smaller size that makes them highly portable. A great option for commuting or travel headphones. An in-line volume control is included for convenience. The headphone market is extremely competitive and quality products can be found in any price range from the low to thehigh end of the market. For under $50, however, you can find a great compromise between cost and features. While we decided upon the Audio-technica ATH-M20x as our best-in-show, the top five list includes several other worthy options that may suit users with different specific needs. At the end of the day what is most important is selecting a pair of headphones that best suits your needs as a user.